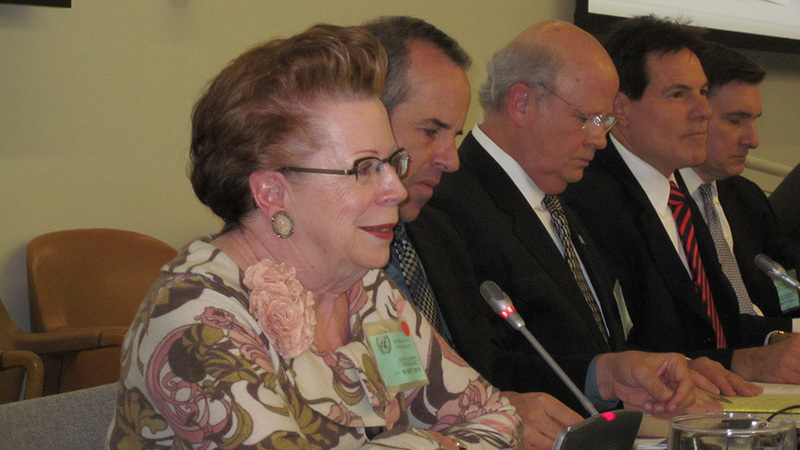 From left to right: Carole Baker, Texas Water Foundation; Doug Bennett, Southern Nevada Water Authority; Malcolm Morris, Millennium Water Alliance; Dr. Anthony Fellow, Cal State U. Fullerton; Hank Habicht, SAIL Capital Partners. James Workman was among a marquee roster of water-sector grandees attending the one-day forum on water issues, emphasizing the need for greater public awareness. He recounts the meeting, which coincided with the opening session of the United Nations General Assembly in hopes that it would draw the delegates’ attention to water. Preheat room with wrenching video of faces dying from diarrheal dehydration. Pack seats with dewy-eyed students. Add dash of earnest and gorgeous movie star. Fold in scholarly jargon on abstract norms. Sprinkle grim statistics presented by chief of obscure global entity. Stir corporate sponsor’s products, posing as social agenda. Grate in activists’ social agenda, concealed as an innocent question. Whip up froth in call for action. Serve congratulations at reception with water-intensive sweets, breads, meats, and booze. Did anything separate last Friday’s “International Water Forum at the United Nations” from so many other such conferences? Beyond business card accumulation, what justifies the time and expense devoted by good people to convening and attending such well-meaning gatherings? To ask these questions, one risks the label of a ‘jaded cynic.’ Or, worse, being ostracized from future opportunities to network, benchmark, collect travel per diem, seek career advancement, and bask in the warm glow of elite inclusion. Did I mention the per diem? James Workman is author of Heart of Dryness: How the Last Bushmen Can Help Us Endure the Coming Age of Permanent Drought. He is also a visiting professor at Wesleyan University’s College of the Environment and co-founder of SmartMarkets LLC, an online utility-based system that unlocks equitable water and energy markets for global cities using the system that has sustained the Kalahari’s indigenous people for 30,000 years. Over the last decade, I am perhaps the most shameless beneficiary at the conference-hopping trough. I’ve absorbed several dozen events, sometimes even as speaker. I have the pens, key chains, frequent flier miles, tote bags, name tags, reusable bottles, and expanding waistline girth to prove it. But I don’t feel jaded —not yet. Indeed, for my two cents, the UN forum was worth all the security checkpoint hassle, because, by accident or intent, it revealed a growing dichotomy and healthy tension between those who approach water issues as a “global” issue and those who regard the water crisis as, fundamentally, “local” in scope. In short: Let’s ensure that 6.96 billion people appreciate the value of fresh water as much as we do. Two Approaches: For Compassion, Or For Money? Such modest ambitions aside, how do we measure, interpret, and express water’s value? By and large, water globalists answered by appealing to our heart strings. They argued that, to improve the lives of billions of thirsty and hungry and sick people, we should rise up and meet growing demand with political will; pump and divert more water; allocate tens of billions of additional public dollars; spend more of our finite money, time, policy, and effort on supply. In comparison, water localists appealed to our purse strings. They emphasized how spending more won’t, by itself, solve our problem. In fact, they said, we can often best meet finite supply by using less — pump and divert less water; burn through less money; transfer cheap technology; economize the Global Recession’s limited funds by focusing energy on human demand. 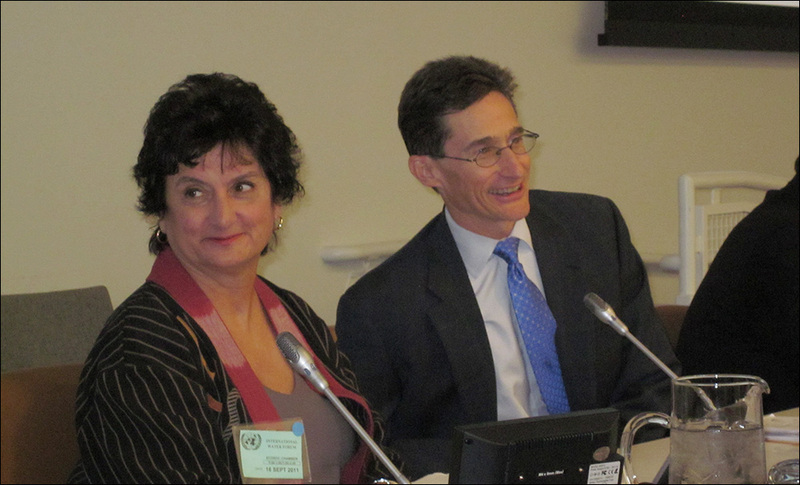 “Saving water costs less than creating new supplies, and builds resilience for the extremely volatile months and years to come.” – Mary Ann Dickenson, President of the Alliance for Water Efficiency, shown here on a panel with Ben Grumbles, President of the Clean Water America Alliance. Do these supply vs. demand agendas compete? Is one suitable for India, the other for Florida? Are they two sides of the same coin? Or are they forever mutually exclusive? Alas, there was no discussion within or between panels. Few acknowledged or bridged the yawning supply-demand chasm. Interestingly, the few who did make attempts tended to be lawyers, economists, literature majors, investors…and women. For instance, Mary Ann Dickinson, head of the ‘local’ Alliance for Water Efficiency (AWE), cited a case in Tennessee, where cheap, fast collaboration quadrupled three hours per day of urban water access into 12; and with no new supply. But, while AWE is based in Chicago, Sacramento, and Washington, D.C., its ‘local’ solutions appeal widely, now reaching into China, Jordan, and the Philippines, along with other developing countries whose metastasizing cities seek new tools to reduce unnecessary water use between 5 and 50 percent. Her point was that conservation transcends borders. As head of the localist Association of Water Resource Agencies, (AWRA) Michael Campana, squeezed sponges to demonstrate groundwater’s hidden value. But, as a globalist, he called on the U.S. to recognize the human right to water, and sought a new online game as a tool to secure understanding of water in the borderless virtual world. That blanket statement might have interested Pat Mulroy, the general manager of the Southern Nevada Water Authority (SNWA), who called on everyone to think of Las Vegas’ local water not as “theirs” or “mine,” but rather as “ours.” By “ours,” she linked suburban tap to city plant; to regional agency; to Colorado River; to 30 million people who share its flow;, to tens of millions more who depend on its hydroelectric generation; to the billions of others who eat food that is grown in the basin. In wrapping up, AWE’s chair, Carole Baker, and SNWA’s conservation director, Doug Bennett, each highlighted local campaigns at education and water efficiency to “climate proof” Texas and Las Vegas. Both localists are doing remarkable work by building resilience and awareness from below — but is it enough? Perhaps what Baker and Bennett did not mention paints the clearest picture: Texas’ “Fed Up!” governor, Rick Perry, recently resorted to begging federal taxpayers to spend on relief for his state’s crippling drought and fires, while Las Vegas is seeking federal subsidies to tap federal aquifers and to divert rivers that reach across international borders. Homegrown solutions may thus depend on transcontinental sympathy. John Donne wrote, “No man is an island.” But perhaps it isn’t land that links our spirits and our fates. Rather, the connective tissue is fresh water. For — through its flows, food, energy, and trade — water inextricably binds my local wants with the global needs of utter strangers. So, if you and I reduce our thirst and hunger here, we will leave more water for human and natural communities, however distant, somewhere else. The upshot? Well, not that I’ll be invited after this open reflection, but perhaps the next conference could take up the task of defining the local vs. global tension by encouraging robust debate in a remote location, where we provide our own tent, food, water, and sanitation…and contribute our per diem to a water organization of our choice – one that is out there practicing what so many of us can only preach. Read excerpts from Workman’s book on Circle of Blue.